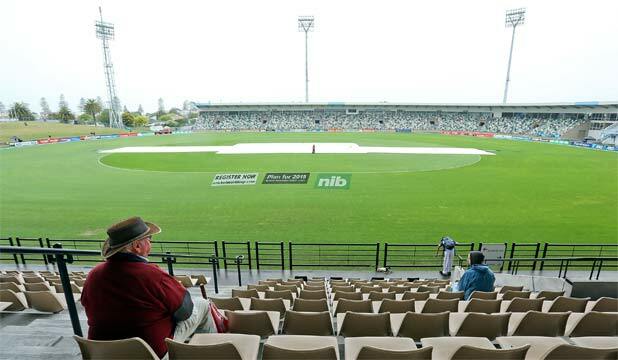 Napier, New Zealand – The forecast on the eve of yesterday’s 2nd One Day International between New Zealand and the West Indies was right as the match was abandoned at the time of what would have been the end of the first innings. So bad was the rain at the start of the afternoon in Napier that not even the toss could be taken. At times, the rain did slightly relent and give glimmers of hope that some play might be possible. However, the dampness of the ground was just too much for the groundsmen to eradicate in the allotted time. With all the factors taken into consideration, Umpires Chris Gaffaney and Ian Gould abandoned the game. The crowd was visibly disappointed, but the puddles on the outfield told the whole story. The match simply could not be played. It was a disappointing end to the year for both teams. The West Indies wanted to extend their lead and New Zealand were aiming to level the series.